instead for full-blown weirdness & what may be THE most annoying child ever filmed. moans, pops up from dark corners, & just happens to require the blood of others for his own survival. is required viewing for all genre aficionados! essentially a mass of liquefying flesh sliding off bone, & sculpted a portrait that’s surprisingly spot-on. 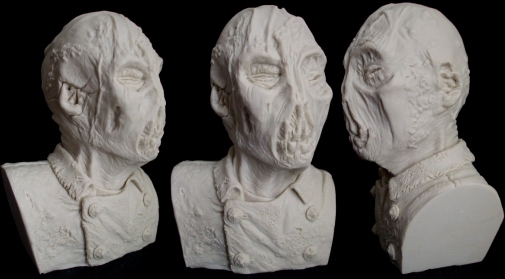 & copious amounts of decomposing rot are all there…lovingly reproduced in cold cast resin! you can have this guy cleaned and primed in 10 minutes flat! earned him a fan base, I’m proud to say you’ll find me right in front…egging him on to produce more Euro Zombies! Get this FREUDIAN fiend before he SLIPS back into the cellar.